Update manager's window, and especially its fields inside the window, are way too small and also it's not resizeable, making it almost useless at least on my HiDPI screen (3200 x 1800). <https://wiki.ubuntu.com/SoftwareUpdates#expanded>: "The Updates Available window should be manually resizable only when it is in this expanded state." 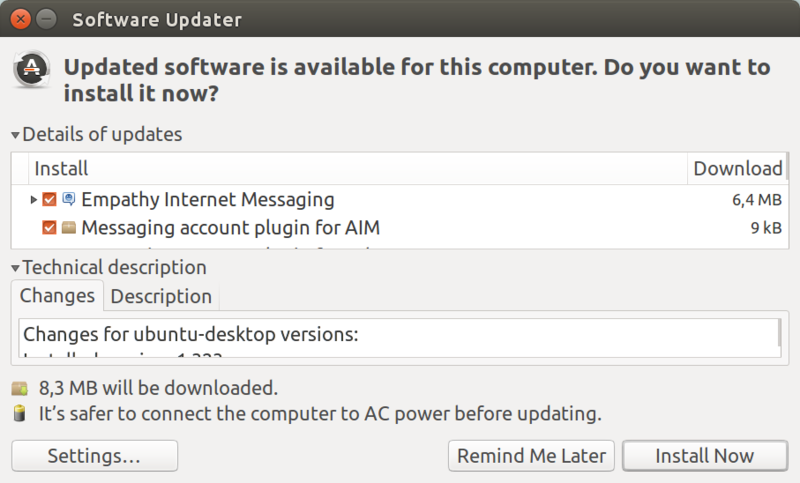 Run the Ubuntu update manager and attempt to resize the window. See above. The Unity SRU fix for Ubuntu 14.04 LTS was cherry-picked from Ubuntu 14.10 where it has been in production use for some time without apparent regressions. Confirmed on trusty, not sure if the issue is with compiz or update-manager though. Michael, could you have a look? Hey Marco, could you have a look. "so, I guess it's something like that it doesn't notify us properly when it changes its alowed actions, or, we don't update when it asks (afaik I ignored some changes that were duplicated)"
Not sure it is Compiz, the same problem also happens with Xubuntu, which does not use Compiz if I remember correctly. Anyway it is severely affecting the usability of the application. As a workaround, right click on the title bar and choose the "Resize" entry. I agree with comment #5. I am using Xubuntu 14.04, and I'm not using compiz as far as I know, but I am still experiencing this non-resize problem with update-manager. Can someone explain why this has been marked as a compiz problem and why it has been marked as Invalid for Trusty? Thanks. Re comment #6: the workaround does not work for me. 1. Right click on the title bar of the window to be resized. 2. A menu will pop up. Choose "resize" from it. 3. The pointer will jump (warp) to the center of the window. 4. Do not click yet. Move the pointer past the edge of the window in the direction you wish to resize (enlarge). 5. Once the desired resize has been achived then click the mouse or tracball etc. The reason this titlebar menu resize contraption exists is that it is part of UI accessibility. You can use the keyboard to control the resize procedure. Exactly this menu item is deactivated (greyed out), it really seems like the window is made non-resizeable. So the bug is still far from being fixed. @Jan Henke - the titlebar resize menu item is not grayed out on my 14.04 system. I'm not using Xubuntu. I have the "ubuntu-desktop" meta package installed. @Metta Crawler: But this bug report is about the fact, that in some circumstances it becomes greyed-out (deactivated). This bug was filed to raise the issue and get somebody to look into the reason for it. That is works on your system is fine, but is not helpful here. It reproducibly does not work on my system, and it would really be helpful to get it fixed. My last post simply pointed out that the work around you describe does not work for those affected by the bug. A workaround that works for me under Unity is to double-click the title-bar - which causes the window to maximise. In its maximised state it has the three window operator buttons (close, minimise, restore/maximise). Hit restore and the window will pop back to its previous size, but now be resizable. Prior to the workaround the title-bar only has two operator buttons (close, minimise), after maximising it acquires the third and resizability. Workaround #6 and #14 worked fine for me. I'm using Ubuntu 14.04 fresh install and I have this issue from the very beginning. Also, I don't know if somebody else has noticed but whenever the Updater icon appears on launcher bar doesn't work when you click on it. So I have to right click and select Quit and then open it again. Sorry if this is not about the same issue. as a work-around? When I get some time to play in a VM I'll do it myself. in the non-resizable window, click on Settings, that will open "Software and Updates" window. After closing this window, the software updater window will be resizable. Problem persists on XUbuntu 16.04.02 with update-manager: version 1:16.04.5. Changing "self.set_resizable(False)" in /usr/lib/python3/dist-packages/UpdateManager/UpdateManager.py should allow you to resize the window.